Hollywood is big on clubs: the Rat Pack, the Brat Back, the Frat Pack. And now there's the comedy crew led by producer Judd Apatow. Guys like Paul Rudd, Jonah Hill, Jason Segel - and Seth Rogen. With films such as 'Knocked Up', 'Superbad' and 'Pineapple Express', Seth's at the forefront of a new generation of comedians who are not afraid to tackle humour that's unsentimental, embarrassing and even raunchy. In short, just like life. 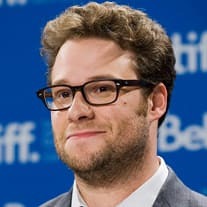 Seth also writes or co-writes much of his own material, including 'Superbad', 'Pineapple Express' and 'The Green Hornet', which earned him a reported $6 million payday. That's a hell of a journey from the comedy clubs of Vancouver, where Seth began performing at around 13, with jokes about Bar Mitzvahs and summer camp. At 17, he got his big break as a pot-smoking burnout on 'Freaks and Geeks'. The show didn't last long, but it did introduce Seth to Judd, who later cast him in the movie 'Knocked Up'. That film turned the last guy you'd think of as father material into a relatable hero. Lately, Seth has taken on topics that are not-so-funny in a couple of films (both of them played last year's Toronto International Film Festival). In Canadian director Sarah Polley's 'Take This Waltz', he plays the husband in a marriage set on self-destruct. And '50/50' is based on his real-life buddy's struggle with cancer. It's about friendship, with a lesson or two on how to survive life's darkest moments.